I have no problem in understanding if you say that this was a great concert for you as you love WHITESNAKE, and so it was symbolic to see them live in one of the years of the snake (according to the Chinese zodiac, that is), that it was an emotional high to sing all those classics along with thousands of voices… But don’t insult my intelligence by saying it was a great show because of Coverdale‘s vocal performance. Getting old is a natural thing, and even if age affects us in different ways, we all go through it. You can make plastic surgeries to fight it in terms of appearance, but so far they haven’t invented an equivalent for the voice. David Coverdale will turn 62 in a couple of months and that should be a reason for quitting, not to be admired for, for still getting on stage. Some people can do it, even older, but Coverdale isn’t one of the lucky ones. His voice is totally gone and he’s slowly ruining his own legend, no matter how much charisma he will always have. The gig started with “Give Me All Your Love” and finished some 75 minutes later with “Still Of The Night”. Before “Is This Love?”, Coverdale asked if Madrid was “still the city of love”. Despite replying loud, the cheering got louder when the song actually began, so I guess the hint didn’t hit home in the majority of the crowd. “In thirty years it’s natural that we lose some friends along the way” and so “Gambler” was dedicated to señor Mel Galley, señor Cozy Powell and señor Jon Lord (may you all rest in peace). A really really long (a.k.a. boring) solo duel between Reb Beach and Doug Aldrich, that meanwhile I found out it’s called “Pistols At Dawn”. In the end, Michael Devin didn’t play a bass solo, but he played the harmonica for a while, as an intro for “Steal Your Heart Away” – song where Tommy Aldridge also shone with his drum solo. Coverdale rested for quite a while during these instrumental breaks, and yet his voice was still miserable. Thanking Madrid for the 30 years of support, “Forevermore” was dedicated to the crowd. Then a medley of “Best Years”, “Bad Boys” and “Children Of The Night”, followed by the mandatory top-3 “Fool For Your Loving”, “Here I Go Again” and “Still Of The Night”, all pale ghosts of what they should be. While saying goodbye, “We Wish You Well” played in the background. 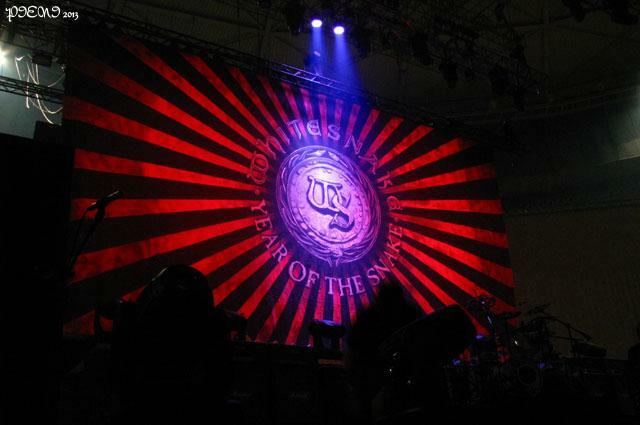 Yes, Mr. Coverdale, I wish you well, but away from the stages.